Posted by abi in ministry, youth ministry. Some people have a job in the church. Others involve themselves in ministry. If you do it just because no one else will…it’s a job! If you do it to serve God…it’s a ministry! If you quit because someone criticized you…it’s a job! If you kept on serving in spite of criticism…it’s a ministry! If you’ll do it only so long as it doesn’t interfere with other things…it’s a job! If you’re committed to staying with it, even when it means letting other things go…it’s a ministry! If you quit because no one ever praised or thanked you…it’s a job! If you stay even though no one notices your efforts…it’s a ministry! If you do it because someone else said it needs to be done…it’s a job! If you do it because you sensed God saying it needs to be done…it’s a ministry! It’s hard to get excited about a job. It’s almost impossible not to get excited about a ministry! An average church is filled with people doing jobs! A great and growing church is filled with people involved in ministry! Posted by abi in ministry, reviews. 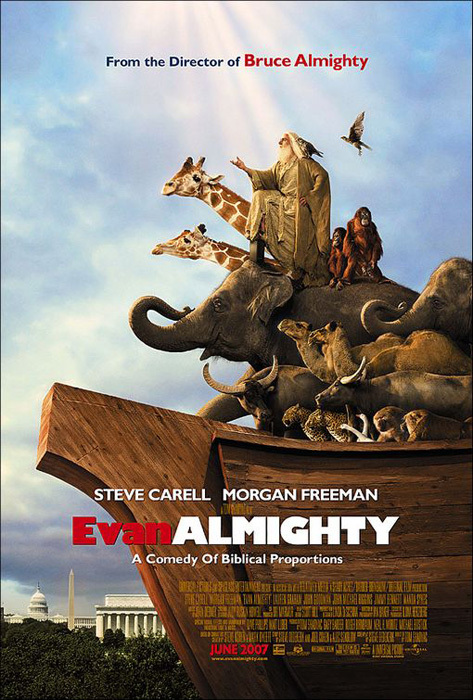 Last night I got to go to an advance screening of Evan Almighty for free. The screening was offered by Grace Hill Media partnering with Youth Specialties and was specifically for youth leaders and pastors in several theaters across the nation. It was fun to see the movie a few weeks before its out – and free is always good! There were several people from Universal Pictures there who talked a little before the movie and asked our opinions after it was over. And there were a few guys taking pictures of the audience and my sister said that there was someone videotaping us. It was an interesting experience. About the movie – it was funny. A little cheesy sometimes for me, but there were definitely some good parts. I liked that it was really clean – its rated PG (2 words and “themes of destruction” or something like that on the website). I think it was cleaner and more family-friendly than I remember Bruce Almighty being. It was more geared towards families too, which is nice. And I didn’t feel that it made fun of God or Christianity in any way. It was interesting to see how they made you aware of how ludicrous building an ark would seem to everyone watching. Put in modern day, in DC suburbs, it was an interesting comparison. Overall, I wasn’t amazed by the movie, but I liked it and will probably recommend it to my youth and their families as a movie worth watching. Its nice to actually have some decent movies out there and good to see that Hollywood is recognizing the strength of the Christian population and trying to put out movies that we can support. Posted by abi in ministry. Our youth group went on retreat last weekend to a local retreat center “ranch”. It was an amazing weekend all around – the weather was gorgeous and in the 70s-80s the whole time. I’ve been hearing reports back from the youth that this was the best retreat ever, so that is good to hear. And I really think that some of them had some good times of thinking about God and worshiping Him in ways that they don’t normally get to. It was a ton of work to prepare for the retreat – but I really did love it. I was in charge of everything all weekend – I know, pretty crazy! I had some great adult chaperones who were helping out too – couldn’t have done it without them. And the youth in the group were a lot of fun – they put up with all my crazy activities and at least pretended to be excited about stuff. 1) Survivor Intro – How our life is like those of the contestants on Survivor TV show and how the verse (Phil. 3:12-14) fits in. 4) Survivors need each other – How we were created to be in community and encourage each other. As the activity with the third talk, we did the somewhat controversial lifeboat exercise (where I gave them slips of paper with different people on them – a short description of their personalities, occupation and then they had to choose which of those would get on a lifeboat and which would drown – I only let them choose 8 out of 16 people to get on the lifeboat) and it was really interesting. Both teams independently chose the same people to get on the boats – even when there were some tough calls of who was more “deserving”. Mostly it ended up being the women and children – those who had a future to look forward to or the doctor who could help them all. I threw in some crazy names just for fun – Bill Gates, Brittany Spears, and our pastor – but none of them made it on the boat. I was surprised that the pastor didn’t make it, but one team had a really good reason – they said that he sacrificially gave up his spot for everyone else and wanted to be there to pray with people in their last hours. I can’t wait to tell our pastor about that. They got the point – that God doesn’t go around and pick like that – whoever deserves it or who is most popular or has the most money. God saves anyone who accepts His Son and the free gift He offers – all we have to do is get on the lifeboat. I gave the youth some personal devotional time after that talk and some of them really did use it and spend some good time with God. A few even came up to me and talked to me about it afterwards. It was very neat, and I just pray that God was and is speaking to them. Then they planned and led a worship service on Sunday morning which was great, because each one of them was involved. Love those kids and really am so thankful I have the privilege of working with them. I can’t wait until I can do this full-time…. Last night for Maunday Thursday, I went to Grace and experienced their time of reflection and meditation. They had stations set up beautifully with a cross in the middle, a foot washing space, communion, and a wailing wall. It was nicely done and very emergant. But I was left with the realization that I didn’t spend very much time in meditation because there were too many other people there. I think I get more out of something like that if I really have the time and ability to do it completely alone rather than in a large (probably 50 or so people were there at the time I was) group setting. I don’t really think that its feeling uncomfortable or anything – I may have in the past – but now I really don’t care what others think of me or how I’m praying, worshipping or whatever – I just wanted to be alone with God and wasn’t. I think some of the other girls in my small group enjoyed it though which was good. We set aside time to do it if anyone wanted to before group and then went back to someone’s apt. who was close to the church for our study. We finished reading the Bible in 90 days! Yay! I feel like I could’ve done a better job at it, there were definately days that I didn’t read and then had to catch up like mad for the next few days. But all in all, it was a good expereince. Standing in the gap, the priest also requires something old: the capacity to hear the groan of God in creation… the groan of God and trying with all your craft and art to do something about it. Here is what we seek in a priest: one who comprehends what is at stake in the spiritual warfare that is our reality; is passionate about the work, and has a characteristic that Jackson Carroll calls resiliency: ‘a toughness combined with elasticity that enables one to endure without breaking when one is facing the tough challenges and difficult tasks that constitute pastoral ministry today.’ This is the second paradox: the Church needs leaders who are soft enough to enter into the pain and tough enough to take it. I also really like this description and think its fairly accurate on many levels. And knowing (and having dated two) pastors and now possibly considering full-time ministry and entering more of a “pastoral role” than ever before – this description hit me hard. Am I hard enough to stand? I think its hard to stand alone too – without a loving community and people supporting you as you stand in the gap before God. When Sir Ernest Shackleton set out to find a crew for what turned out to be his ill-fated voyage to Antarctica in 1915, he placed an ad in the Times of London which read: “Men wanted for hazardous journey. Small wages. Bitter cold. Long months of complete darkness. Constant danger. Safe return doubtful. Honor and recognition in case of success. Ernest Shackleton.” Amazingly, over 5,000 men applied. The call to youth ministry—its own journey of adventure, risk, and discovery—is likewise a calling unsuited to the faint of heart. And yet, despite the challenges, despite the likelihood of low honor and recognition, despite the small wages and occasional seasons of darkness and discouragement, we sign on, eager to see where God might lead us. And it’s an amazing adventure! But how do we know if we’re called to this journey? How do we discern God’s calling? How do we know if we’re called to ministry as servants of the servants? And who in their right minds would want to face the hassles and hazards of ministry without some fairly certain sense that this is the will of God? The great theologian H. Richard Niebuhr wrote of four different calls that come to those set apart for pastoral ministry: (1) the call to be a Christian, (2) the secret call, (3) the providential call, and (4) the ecclesiastical call. First and foremost, we must understand that the call of God moves from the inside out. It’s an adventure that begins in the heart. Ben Patterson writes, “There is always a sense of compulsion, at times even a sense of violence, about God’s call.” Jeremiah described it “…like a burning fire shut up in my bones; I am weary with holding it in, and I cannot” (Jeremiah 20:9). The Apostle Paul avowed, “…woe to me if I do not proclaim the gospel!” (1 Corinthians 9:16). These are those deep inner nudges of God’s secret call to ministry. Sometimes it cajoles us; sometimes it prods us; sometimes it reassures us; sometimes it pesters us—this intangible, inexplicable sense that God is calling us into pastoral work and a growing sense of holy discontent with anything other than the pastoral vocation. In fact, Charles Spurgeon, who saw this holy discontent as an important sign of a pastoral calling, encouraged his students not to pursue pastoral ministry if they felt they could be content doing anything else. The English word for….A vocation or calling is different. Derived from the Latin word voco, it points neither to a map nor a guidebook, but to the ultimate guide. The emphasis isn’t on following a course but on responding to a voice—no schedule, no itinerary, no well-laid plans. This is walking by faith and not by sight (2 Corinthians 5:7). The whole enterprise depends on listening (John 6:28-29). If the nudge is persistent—dare I say nagging—keep moving forward. Don’t wait for the road map; start moving and let God lead. Just as it’s easier to steer a moving vehicle than a parked one, guidance comes more often to those on their feet than those on their seats. Waiting on the Lord is fine; but don’t make God wait on you. As God explained to Moses, sometimes the confirmation of your call will only come as you are obedient to that call—not before you obey, but as you obey. In response to Moses’ reluctant balking, “God said, ‘I will be with you. And this shall be the sign for you that it is I who have sent you: when you have brought the people out of Egypt, you will worship God on this mountain. '” (Exodus 3:12). The sign he was sent came as he went. This phase of the call should also be marked by cautious, honest self-examination. Is this really about my passion for Christ, or about my passion for youth ministry? Is this about my desire to meet the needs of students, or is it about my needs being met by being in front of students? Do I have the gifts, the temperament, the relational skills that this work might require? Am I at a place of spiritual maturity where I can be a healthy, consistent role model for students? God [also] never calls us to do what we’ve not been prepared to do (1 Thessalonians 5:24). The question to ask is a simple one: “Has God given me gifts, talents, experiences, the aptitude, and the temperament for ministry? First of all, if this is God’s call upon one’s life, the greatest joy will always be in obedience. Whatever God leads us to do is a worthwhile pursuit. Folks we now refer to in the church as “ministers” are, in the New Testament, called diakonoi. Derived from the Greek word for “service” (1 Corinthians 12:4-30), it was Paul’s favorite title for Christian leaders. Significantly, it’s the same word that’s the root for “butler” and “waiter.” Will Willimon observes how odd it is that the church should designate its leaders by so mundane and lowly a term. In thinking through the question of calling, it’s a fact we would do well to consider. Those 5,000 men who sought to volunteer for the fateful voyage of The Endurance had no idea where the journey might lead, but they had both a heart to serve and a heart for adventure. In considering a calling to youth ministry, surely we need no less. – Ash Wednesday service at my new church where I work was the most meaningful I have ever had (not growing up in a “traditional” church we didn’t do as many of the liturgical things, but still). I really appreciated the time of reflection and the symbols of the faith that were practiced. – After Ash Wednesday service, went to the pub (nope wasn’t feeling particularly Catholic, just was a Wednesday and that’s what I generally do on Wed.) and it was a really funny night – half of us had ashes from different denominations of churches, one of my ex-pastor Marks’ was there and he had his Pastor collared shirt on, so people mistook him for a priest, several of our Orthodox Jewish friends, and a few random, somewhat flamboyant people were there….just made for a hysterical mix of people in my book. – For Lent, I was praying about what to give up. But as I am already trying to get all healthy, working out and eating less….anything along those lines that I would normally think to give up (i.e. alcohol or chocolate) seemed selfish to me because it would benefit my new health goals too much. And there was nothing else that I was really feeling that God was putting on my heart to give up. So after praying about it and after sitting in the Ash Wednesday service, I decided to take up something instead. I am attempting to do some meditative artwork. I started one piece and have ideas for others, but if they don’t get done, its ok. Not about legalism or needing to get things done, just wanting to spend some prayerful, meaningful time with God while making art. So I’m excited about that. We’ll see what comes out of it. – And there have been quite a few more things but right now they are all swirling together into one. I am still doing good with eating pretty healthy and just have learned to make that a part of my lifestyle. I try and make it to the gym 5 or 6 days a week and have been pretty successful at that and it feels really good. and I need to find time to have some SOLITUDE – that’s some homework from my mentor for this month. I think I need it too.